The name La Lancette (lancet) refers to the name of an old street that was once located on the same site. It supposedly referred to a sign depicting this instrument, which was used by doctors to bleed patients. The reconstruction plan drawn up by the architect Marc Brillaud de Laujardière, the first architect heading the reconstruction of Saint-Malo (1944-1947), reconstituted this whole section of the town, which had been destroyed. The passage passes through one of the two interior courtyards established under the plans drawn up by his successor, Louis Arretche. 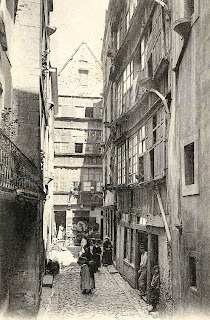 Certain narrow streets were removed, while others, like this one, were transformed into arched passageways running under buildings. The majority of the layout is more regular. 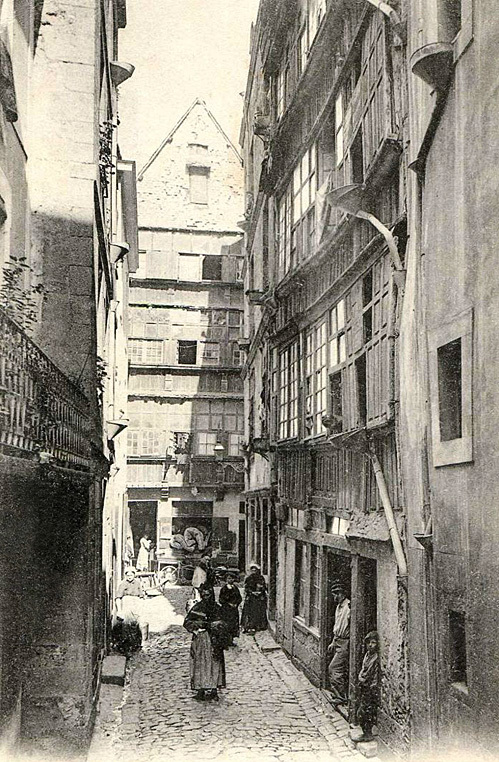 What is interesting about this courtyard is the integration of two old houses with the end of a stone façade making it possible to observe both old Saint-Malo and rebuilt Saint-Malo. These old façades are not to be found in the frontage of the new buildings. The new architecture thus harmonises with the old architecture through its use of materials (granite, slate), implementation of them, and the general lines of the new buildings.